Learn to import logged data to Ubidots using Google Apps Scripting feature available in Google Sheets. 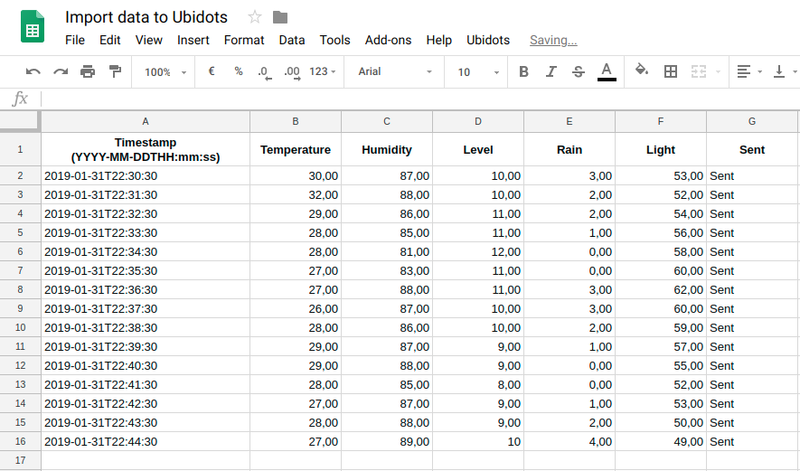 Following this guide, you will be able to import the data from a Google Sheet, adapt the payload to match Ubidots HTTP API, and post the data to Ubidots where it can be utilized in many different ways. Common uses: This particular uses of importing data is vast, but it can comes in handy especially when importing historical data to fill gaps, analyze historical data with recent data, or simulated data-sets to further develop the end-user IoT App being assembled in Ubidots. Column D - "Variable Label 3"
Note that the first column corresponds to each data point’s (dots as we call them at Ubidots) timestamp and formatted to a readable timestamp as YYYY-MM-DDTHH:mm:dd:ss . The following columns of the sheet are the variables to be uploaded to Ubidots with their respective timestamp values. The final column should be label as “Sent” and will be updated automatically by the script upon a successful reception of dots to Ubidots. NOTE: If any cells are left empty, the script used to import data will bypass that cell and continue with the import. NOTE 2: The sheet must be named as "Data". A new tab will open with the Google Script Editor. Step 2: Edit the project’s title and the script’s name. 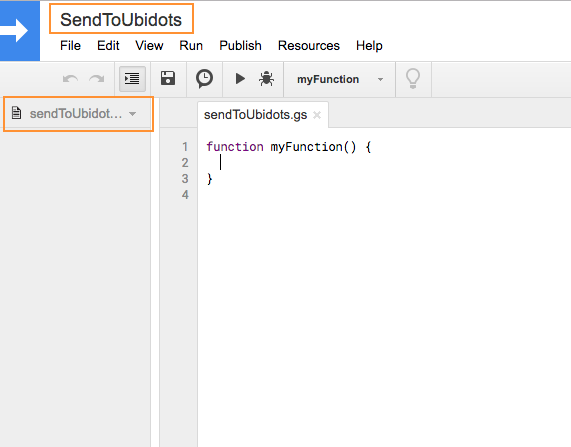 We named our example project title and script name “SendToUbidots” accordingly. Step 3: Copy and Paste the below code into the editor. Be sure to update where indicate your Ubidots account TOKEN in line 1 and then assign DEVICE_LABEL in line 2 of the Device in Ubidots that will house the variables' data. Step 4: Save the code by clicking on the “Save” icon and then you’re ready to import data to Ubidots. After saving the script in the previous instruction, a new dropdown menu will appear in your Spreadsheet's mainbar, as displayed below. There you can find your “Ubidots” script and once clicked, the option "Send Data" becomes available. Select "Send Data" to run script and import data. 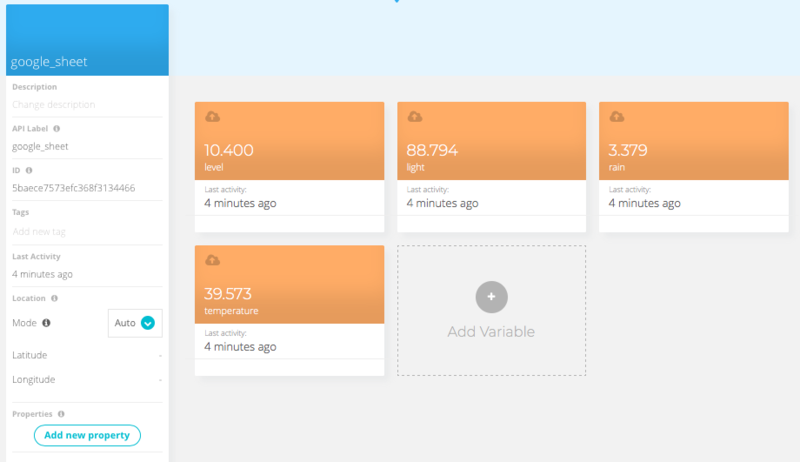 After clicking "Send Data," the script will run automatically reading the formatted table to send every dot (cell) to the designated device in Ubidots according to the assigned timestamp. Now with data simply available in Ubidots, you can continue to assemble and perfect your IoT App as needed.